I'm writing you with a full stomach and a contented heart because we've just spent a week in Bretagne (Brittany). Bretagne is on France's northwestern coast below Normandy, and it's a popular vacation destination for Parisians who want get out of the city. It's also known for its age-old erected menhirs and dolmens--great Stonehenge-like monoliths that you might have recall from Asterix comic books. We didn't see those rocks, though we enjoyed hiking among similar ones with my distant relatives. At least, my probable relatives--they share a variation of my maiden name and though we haven't proved we're related, genealogy suggests that we are. I enjoyed staying with this retired couple ten years ago, and this past week my husband and children got to join me in experiencing their amazing hospitality. What made our stay doubly fantastic was that this couple's children and grandchildren were also staying in this same home on vacation, so we had great company and my children got a week of constant playtime with great French kids close to their age. Within a day, my six-year-old daughter was speaking only French--even to my husband, who doesn't speak French! 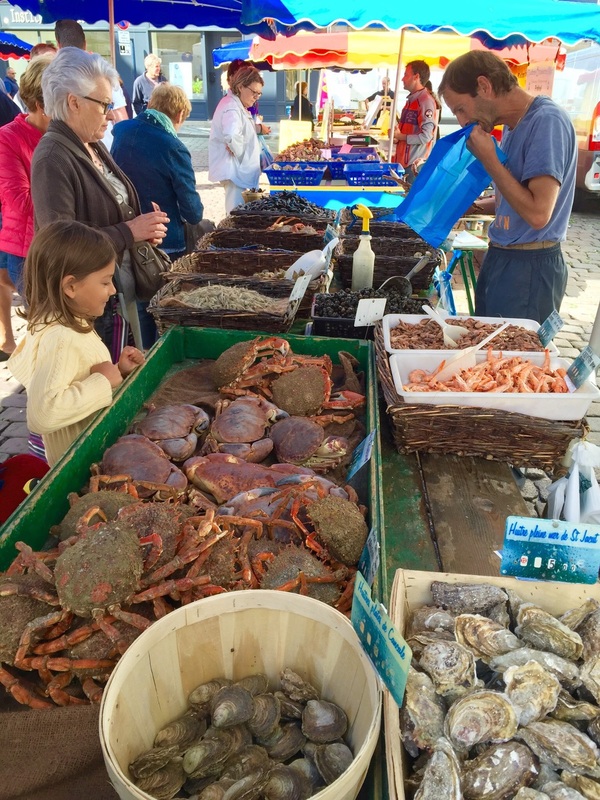 My three-year-old son remained resistant to French (and resistant to almost everything, actually--I've been tempted to secretly call him le résistant), but I'm still so grateful for this family immersion experience. Most of our days were largely spent at the table and at the beach, though we also stopped by a library, attended the local Catholic church, and played games at a family-oriented event. Each day, Mamie, as I'll call my Breton grandma here, prepared four- and five-course meals that were truly a feast. Over the course of the week we had mussels and bulots (a type of escargot), crab and crevettes, ratatouille with vegetables from the garden, crêpes, roast chicken and more, all accompanied by cider or wine and dessert. (Bretons even have their own version of Nutella: NutaBreizh, a caramel chocolate spread.) The kids rarely made it though such long meals without going out to play, but we adults had such a lovely time around the table. To give Mamie a mid-week cooking break and to share a taste of American food with our friends, my husband and I chose a night to make hamburgers, potato salad, and nectarine cobbler. It's such a delight to share good food with friends, isn't it?! Staying with French friends always reminds me of the joie de vivre that the French have--and how much of that is connected to time, conversation, and food. Getting back to the beaches, though, I should mention that the Breton coast is impressive in its array of sea life. We Americans were impressed to find cockles, snails, clams, and oysters among the wet sand and rocks. Since there were such novel treasures around, I enjoyed collecting shells as much as my children. I'm fairly confident that the mid-week stink from my husband's backpack came from the snail I tossed in along with the seashells! Overall we had such a great stay that I'm sure the past week will be counted among the best of our three months in France. It was just such a joy to communicate in French among family friends, new and old, enjoying their generous gift of time and hospitality. 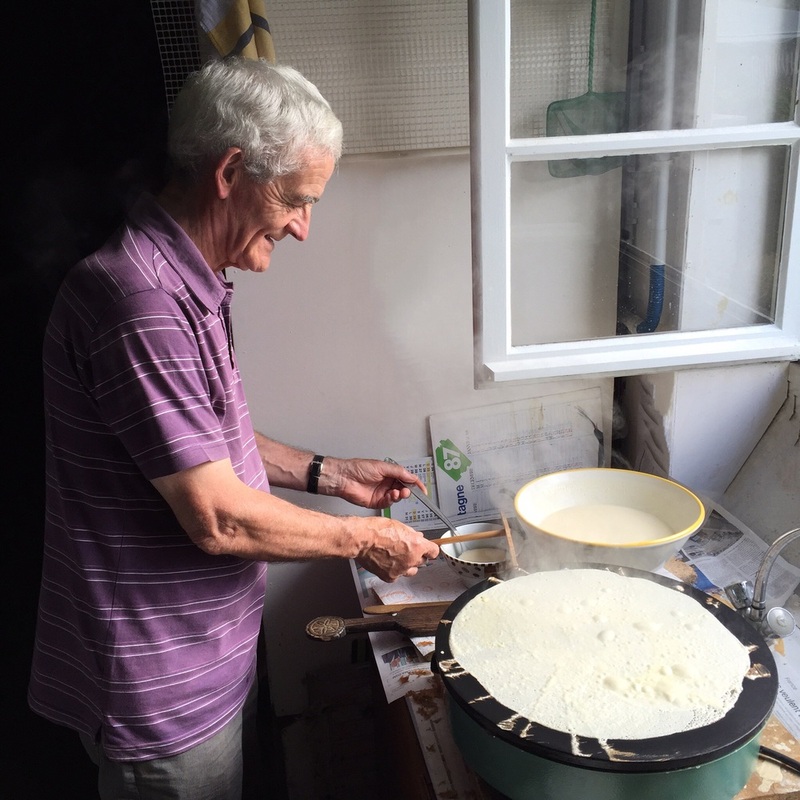 My Breton "papy" making crêpes--it was such a delight to watch him! Have you been blessed by someone's gift of hospitality this summer? What is one of your favorite memories involving food and family? This post contains an Amazon Affliate link.